Originally manufactured in 1964, the Grommes Precision G5M is a six-channel analog tube mixer first designed for use in concerts and live performance. 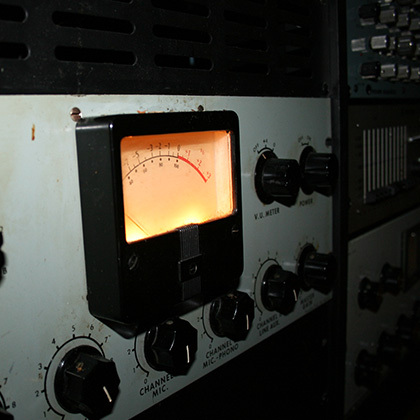 By the late 60’s and early 70’s, recording engineers found them to be extremely useful as pre-amplifiers in the studio, often using them to record and comp vocal backgrounds and small horn and string sections. No longer manufactured, the Grommes Precision G5M is considered to be an extremely rare and prized tube mixer/preamplifier because of its uniquely warm and silky tube sound. Located on the rear side of the unit, the Grommes Precision G5M has 5 transformer balanced XLR inputs, 1 phono input, and 1 line input. On the front of the G5M, the first four channels are dedicated microphone inputs. The fifth channel can be switched between a microphone and phono input. The sixth channel is a dedicated aux/line input. At the top left hand side of the unit are the controls for the tube equalizer, which has shelving controls for both bass and treble with a range of ±20dB. At the far right hand side of the G5M is the master gain stage to control output level. The power switch to the unit resides above the output control. Despite their age, both of our G5M’s here at Studio 11 still sound amazing. Though we don’t use them as much as we used to, the G5M has become a nice option when our clients are looking for that ‘one of a kind’ old school sound. As far as we know, we are the only recording studio in Chicago that owns a pair of G5M’s. So if you are looking for that classic sound of the 60’s, give us a call. We make your sound happen here at Studio 11.